I have two eyes, but there are over 4000 smaller 'eyes' in each main eye. I am usually black with transparent wings and up to 1/4 inch long. As a larva, I eat organic material like plants, food or juices in trash cans. As an adult, I can only drink liquids, usually the juices of decaying or sweet substances. I am the most common of all flies and always found in the company of humans, human activities or homes. I am inactive at night. I go through four stages of development: egg, larva, pupa and adult. I fully develop in only about 10 days. Females can lay 2,500 eggs in just a month. 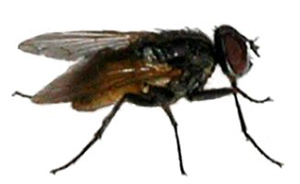 As an adult fly, I live around from 30 to 60 days.